Lunt LS50THa modification to 200 mm aperture - SolarChat! I present my latest Hα mod, consisting of a GSO Ritchey-Chretien 8" + Aries 214 mm ERF + Lunt 50 etalon assembly. I completed it back in June, but unfortunately haven't had conditions and time for an imaging session yet (beside basic testing). I'm planning on putting it to good use next year. The adapter attaches to a (GSO) 50 mm extension ring. Of course the mounting screws are short enough not to touch the glass. I did some basic tests, verifying focus, uniformity and sweet-spot size: everything as expected. Disk contrast is somewhat lower than with the 90 mm refractor (and SS Lunt 50 is not very contrasty to begin with), but post-processing can handle it. With my 1.6x Barlow and ICX445 sensor I needed around 1.35 ms exposure (no gain) to fill the histogram in the middle of the disk (~0.7 ms on the refractor). 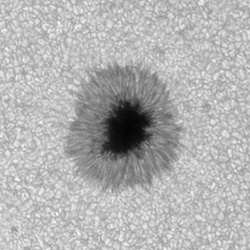 I also tested white light; the ERF has some residual visual spectrum transmission outside Hα, and to get close to a ND 3.8 solar film config I used a Baader 1.25" ND 1.8 (1.5%) + Solar Continuum filters, giving me a few ms exposure at the disk center. Very interesting, can't wait to see how it turns out and how it performs! Gives a lot of promise to some future mods. Do you think its possible to do something with a focal-reducer to get to F6.3 on a standard C8? Pretty close to the native focal-ratio right? I would fear the back focus would be insufficient (Lunt 50 needs some ~180 mm). With an SCT it would be easier to simply attach a PST (which works at f/10). I was just thinking of quality difference between a 50mm Lunt etalon and a PST etalon for this purpose. If the SCT would need lots of back focus with a focal-reducer with a 50mm Lunt Etalon, couldn't extensions provide that back focus without much issue? You need back focus with both. No such thing as a free lunch in solar Marty. Back focus goes in not out. I guess I'm confused with the language... back focus referring to travel distance into the OTA? Back focus = distance from the rear of the OTA to the OTA's focal plane. Etalons, telecentrics etc. need to be inside this distance. RC has quite a lot, SCT somewhat less, and adding a focal reducer moves the focal plane in, so reduces back focus.